White felt material for craft projects, tack repair, etc. Measures 48” x 36” x 3/16” thick with additional material on one end. New & clean. Light Grey fleece material for craft projects, tack repair, etc. Make your own girth covers, halter fleece pieces or saddle pad. Measures 66” x 75” x 1/8” thick. New & clean. 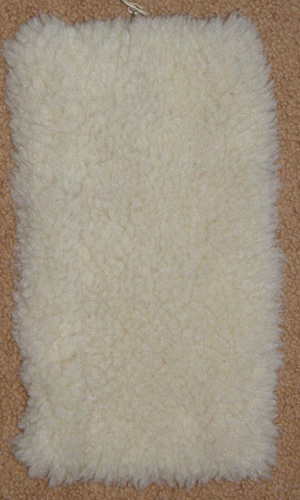 Tan fleece plush fake fur look material for craft projects, tack repair, etc. Make your own girth covers, halter fleece pieces, etc. Measures approx 44” x 44”+, & since a corner was cut out, we only measured to the compete part. New & clean. Black fleece plush fake fur look material for craft projects, tack repair, etc. Make your own girth covers, halter fleece pieces, etc. Measures approx 36” x 62”. New & clean. Looks lovely, glossy, like a mink. Blue fleece material tube approx 2 3/4“ wide inside x 32“ long. Make your own halter fleece piece, girth guard or custom tack cover, etc. Should be too narrow for girth cover, but could work on breastplates, harness pieces, or cut to fit halters, etc. White fleece material piece for craft projects, tack repair, etc. Make your own halter fleece piece, girth guard or custom tack cover, etc. Measures approx 6 1/2” x 12”. White fleece material for craft projects, tack repair, etc. Make your own girth covers, halter fleece pieces or saddle pad. Measures 45” x 47”+. New & clean. White plush felt or fleece material for craft projects, tack repair, etc. Make your own girth covers, halter fleece pieces or saddle pad. Measures 36” x 2 1/2 yards. New & clean. Light or pale Bluey fleece material for craft projects, tack repair, etc. Make your own girth covers, halter fleece pieces or saddle pad. Measures 38” x 45”. New & clean. Lovely long haired gray/white cat or kitten appliqué patch that can be ironed on. Approx 2 3/4” high x 2” wide. Cotton/poly blend dress material remnant that is in a red, black & white bandana type print. Lightweight fabric. Measures approx 4 yards x 45” wide. Printed on edge Princess Fabrics Inc Patt #80 7. Vintage material from a sewing shop that closed. Clean, never used, no holes or flaws that we can see. Package of assorted feathers from Guinea Fowl. Lovely spotted feathers great for fly fisherman tying their own flies or for crafters. Each package of 20 feathers will include 1 long wing weather & 19 smaller white, light grey & darker grey body feathers.